This year’s international air show takes place from 15-21 June at Le Bourget airport. 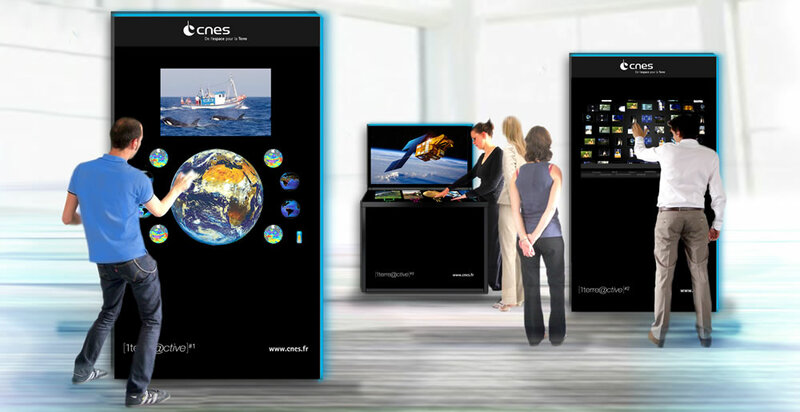 Amidst the 2,000 exhibitors and 140 aircraft on display, CNES’s pavilion presents a resolutely forward-looking vision. A Mars rover takes pride of place at the entrance to the CNES pavilion. Credits: CNES. Inside the pavilion, 2 interactive terminals and a multi-touch table showcase France’s space activities. Credits: CNES. 400,000 visitors are expected at this year’s International Paris Air Show. 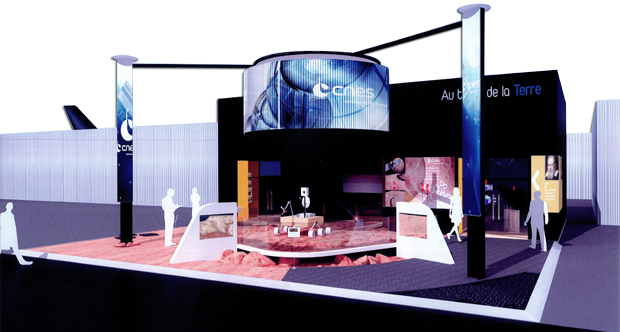 CNES is maintaining a high profile at the show with an original and resolutely forward-looking pavilion. A Mars rover standing on a simulated rugged terrain will be standing guard outside, at the front of a 150-square-metre dedicated exhibition space. Overhead and on either side of the rover, giant screens will show a continuous sequence of programmes about French space activities. Further on, inside the pavilion, visitors will be treated to a demonstration of French expertise in launcher technologies, with Ariane 5, the Russian Soyuz launcher and the future Vega launcher soon to start operating from Kourou, French Guiana. The CNES sphere. Credits: CNES. The 2009 Paris Air Show will be packed with technologies and innovations. Also inside the pavilion, 150 square metres of exhibition space will be given over to all kinds of mock-ups, films and interactive features, including the 2 interactive CNES terminals and the multi-touch table. And the icing on the cake will be a giant sphere looking as if in levitation, revealing our Earth from every angle. Alongside the exhibition, Novespace’s A300 Zero-G will be conducting a parabolic flight for the 1st time at the event on Tuesday 16 June. The lucky winner of the competition organized by CNES and RTL will be interviewed during the flight by the radio station’s presenters Vincent Perrot and Vincent Parizot.